Facebook has five mobile apps, no clear way to monetize its mobile users, and it is now looking to build a smartphone, according to a recent New York Times report. Yes, we've heard this all before. This the the third time the social network has been reportedly working on a smartphone to rival Apple and Google, which would arrive in consumers’ hands some time next year. But, this is the first time the rumor start making sense given Facebook's post-IPO pressures to make money and 900 million user base. 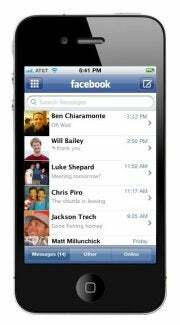 To refresh your memory, the first time we’ve heard of the Facebook phone was in 2010 from TechCrunch, and the second time in 2011 from AllThingsD on the partnership between the social network and HTC. Facebook denied the rumors on both occasions and the only Facebook-enabled phones from the manufacturer were two HTC Android devices featuring some software and hardware integration with the social network. According to the Times report, Facebook’s first two attempts at making a smartphone were real, and not just rumors, but the phone never arrived because the social network underestimated the difficulty of building a smartphone. The third time is different, though: Facebok has hired some half a dozen former Apple software and hardware engineers who worked on the iPhone and iPad to help. With some 700 million users worldwide, Facebook is probably close to reaching its peak. While the social network uses several kinds of targeted ads to make money, it has difficulties monetizing some 200 million users who use Facebook from their mobiles. That’s not to say Facebook doesn’t have a strong mobile presence. On the iPhone alone the social network has four different apps: an all-encompassing app among the most downloaded in the App Store’s history (also on Android), a Messenger app (also on Android), a fan page management app, and the latest addition is Facebook Camera, an app similar to Instagram (also on Android), which the social network bought this year for $1bn too. Facebook even has its own app store, however, it is missing a key feature on the iPhone, which is native iOS integration. In contrast, iOS users can tweet from most apps of the OS directly, and upload photos to the network, while Facebook has not gained such privileges from Apple. Facebook’s mobile apps are perhaps an indication of what core features a phone from the social network would focus on, but it’s unclear what OS it would run. Earlier speculation indicates it would be a modified version of Android -- similar to the Kindle Fire. But the question is, if Facebook is working for some two years on an Android smartphone, why does it have only two apps on Google Play, while on the iPhone it has double that? As my colleague Sarah Jacobsson Purewal pointed out earlier this month: There are many ways Facebook could utilize its 901 million user global network to its advantage. "It could create the world's largest online phone book -- suddenly the idea of a Facebook phone doesn't seem so crazy after all."